Japan is making an all-out bid for the Kuala Lumpur-Singapore High-Speed Rail (HSR) contract to construct Southeast Asia’s largest ever infrastructure project. Japanese ambassador to Malaysia Makio Miyagawa said the Japanese package would be a holistic one with the best HSR technology via the world-renowned high-speed railway system Shinkansen, plus total transfer of technology and local vendor development to greatly benefit Malaysian and Singaporean companies, including small and medium enterprises. “We will be offering our best-suited technologies to Malaysians and Singaporeans as well as full-fledged training for the officials, operators and engineers of both countries so that they can start the operations by themselves from day one. “Japan would also like to offer the most comprehensive financial package which would help the two nations to reduce as much of their financial burden as possible in introducing this system,” Miyagawa told Bernama in an interview. Bids for the HSR, described as a game-changing joint venture between Malaysia and Singapore, must be submitted by the middle of this year with the contract expected to be awarded by year-end. Other bidders for the project may include those from China, South Korea and France. The 350km HSR is intended to cut travel time between Kuala Lumpur and Singapore to 90 minutes and stimulate the economy of several localities along the route, and it is projected to start operations around 2026. Malaysia’s MyHSR Corporation Sdn Bhd and Singapore’s HSR Private Ltd announced on Dec 20 that they would start accepting bids for a railway “assets company” which will be responsible for designing, building, financing, operating and maintaining all rail assets. 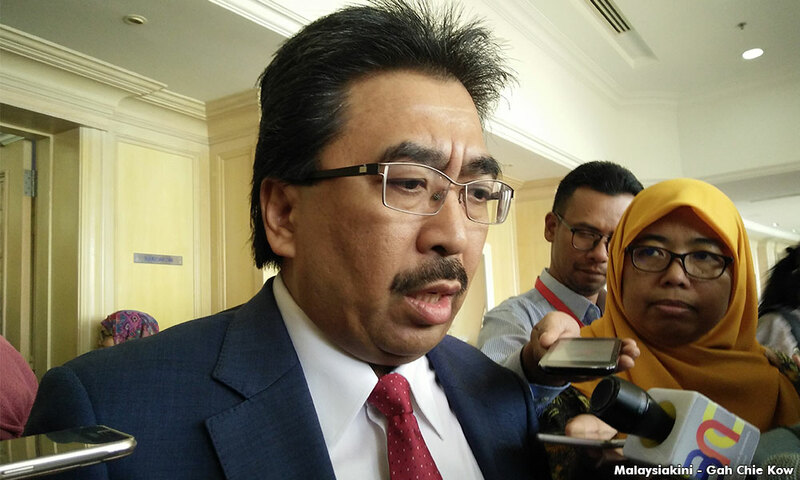 Finance Minister II Johari Abdul Ghani (photo) reportedly said that the project, which will have eight stations, would cost between RM50 and RM60 billion. Miyagawa pointed out that Japan’s engagement posture would tie closely with the country’s long-standing philosophy of economic assistance particularly in Asia. “The philosophy of our economic assistance has all along been in such a way that Japan has assisted the recipient nations to stand on their own feet. “It would not like to dominate the benefits but to share them. It would withdraw from the operation when you are ready to take over. If you would like us to stay on for some years, we would. “It is not Japan’s way to win (a contract) and run away. That would be irresponsible,” the ambassador said. He said Japan had already been offering technology, human capital and financial resources to enable its companies to collaborate with companies in Malaysia and Singapore. “In the high-speed rail system, our government and private sector would be ready and are very keen to collaborate with local industries in Malaysia and Singapore,” Miyagawa said. He said that the project would invigorate and reinvigorate the economies of Malaysia and Singapore. Japan’s edge over other bidders, he said, should be viewed from the most important aspect of any public transport system – safety. “Japan invented the bullet train technology. The advantage of the Shinkansen is that it has been operated for almost 50 years without any fatal accident or human capital problems. “This is the merit of the system which is based on the superiority of the hardware as well as software operations based upon the accumulated know-how of the engineers and operators in Japan,” he said.